- What are you waiting for!? It’s free, go ahead and download! 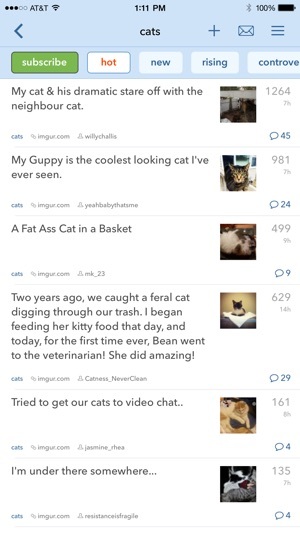 Fixes issue with certain gfycat's not loading. Coming from iAlien (which I was very happy with) was kinda weird. The menu bar being on the right than the left was hard to get used to also. BUT as time went on the app gained more traction and more customization options kept being added. Things like what happens to a video or post when force touching (for force touch compatible devices) or what icon you prefer to use. Dark and light mode with a single tap! 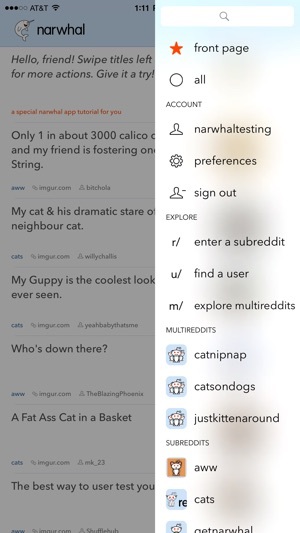 No going through settings to change the mode when viewing at night or day. The font you read can be changed. Literally almost everything can be changed to your liking. You can even hide certain menu options that you find yourself never using at all. Hopefully one day they add an option to switch the menu tab from the right to left lol. Recently a new tab was added called recently viewed and my goodness I did not know how much I actually would use that tab. I always find posts I find interesting but forget to save it and wouldn’t be able to find it later. Now I just go to that tab and it’s there! It’s super useful. I was an Alienblue user when it was a good app. Then Reddit bought Alienblue just to destroy it and replace it with the official Reddit app which I only hear bad things about. 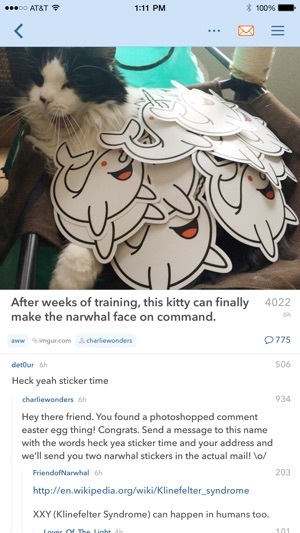 Narwhal took the best of what users love about Alienblue and expanded upon it. The $4 to make this ad-free was more than worth it. The app is so good, the developers are selling t-shirts now due to demand. And now, with the update of true black mode, no more greyscale night mode; this things looks absurdly polished now. Just pick this up and never return to another Reddit client that leaves screen real estate to die on the sides or never go back to official Reddit nonsense. Update: severe issues with multiple accounts. Sometimes I have to uninstall/reinstall to get back to my other account. iPad 10.5 UI to iPhone X? I love this app so much! 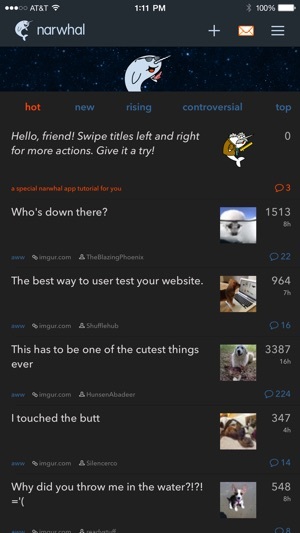 I tried every reddit client out there before downloading Narwhal, and this is the one that works for me. 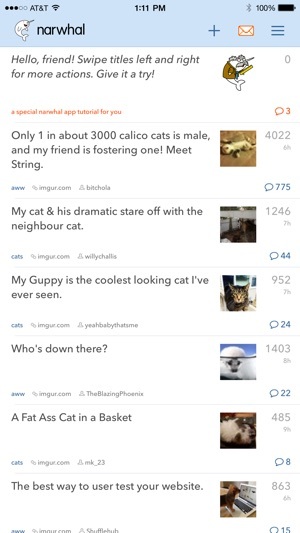 I love it on my phone and ipad, and I wish reddit looked like it on the actual website. The ipad app, though, is so much better than the phone app. Would you be able to allow plus-size phones and the X to work like the ipad UI in when turned to landscape? Not sure how much extra work it is, but I'd love it. I supported you guys and would really appreciate it if you'd add that feature. And please take care of the gifs that autoplay sound until the app is force-quit. Thanks again for this awesome app!